A trip to Las Vegas would not be complete without thrilling adventures and of course, gambling. But when you run out of gambling money, what do you do? Don’t fret. There are plenty of free things to do in Las Vegas. The good news is that you don’t have to be a high-roller to get the full Las Vegas experience. You can still have tons of fun without having to open your wallet. There are a variety of free attractions to experience – Fall of Atlantic at Caesars, Hershey’s Chocolate World, M&M’s World, The Linq Promenade and the Volcano at the Mirage, to name a few. You can view magical gardens, hike spectacular trails, and watch live entertainment for free, any day of the week. Here are 6 free things to do in Las Vegas. 1. Watch the World’s Largest Permanent Circus- Visit the Circus Circus hotel-casino for a free show featuring death-defying stunts, jugglers, acrobats and unicyclists. The show is performed for about 10 minutes every half hour between 11 a.m. and midnight. 2. Visit the Bellagio’s Conservatory of Botanical Gardens- Each season designers transform this 14,000-square-foot floral playground into a magical garden displaying distinctive colors of seasonal displays made of stunning flowers and ornate sculptures. Visit for free and explore 45,000 flowers, 1,950 shrubs and 20 trees. 3. Go on a Hike- Red Rock Canyon National Conservation Area is located 17 miles west of Las Vegas. Embark on a hike to view tons of plants, animals and unique geologic features. Some of the best trails for hiking include Turtlehead Peak Trail, Calico Tanks Trail, Pine Creek Canyon Trail and First Creek Trail. 4. Entertainment on Fremont Street- From live entertainment to concerts and Viva Vision light shows, there is always something exciting happening on Freemont Street. View the world’s largest functioning fire hydrant and visit the Burlesque Hall of Fame. 5. 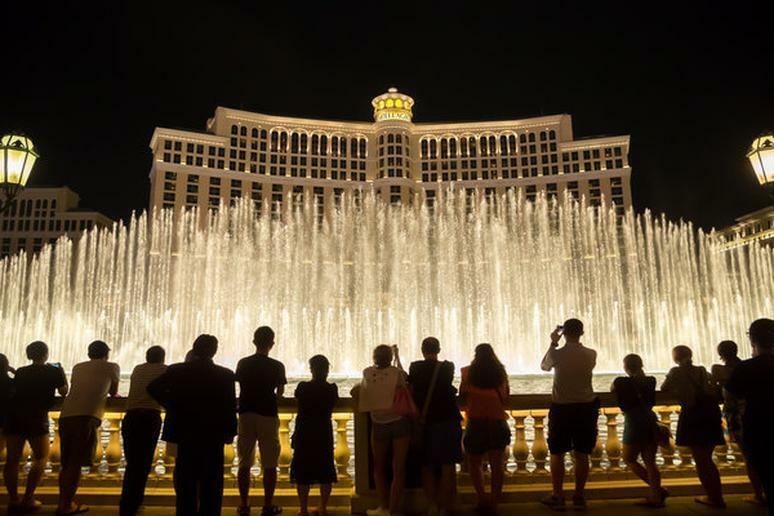 Watch the Bellagio Fountains- Enjoy a free show featuring a combination of music, lights and water at the Bellagio. It is one of the most popular attractions in Las Vegas. The shows are choreographed to more than 30 different songs. Mondays through Fridays there is a show every half hour from 3 p.m. to 8 p.m. and every 15 minutes from 8 p.m. to midnight. 6. Visit the Aquarium at the Silverton Hotel- Sit down on a comfortable bench or walk around to view this free aquarium at the Silverton Hotel. It features 160 species of fish from around the world. View “mermaids” as they swim among the fish in this 117,000-gallon reef aquarium and catch divers feeding stingrays. The Most Beautiful Public Gardens in the U.S.